2. 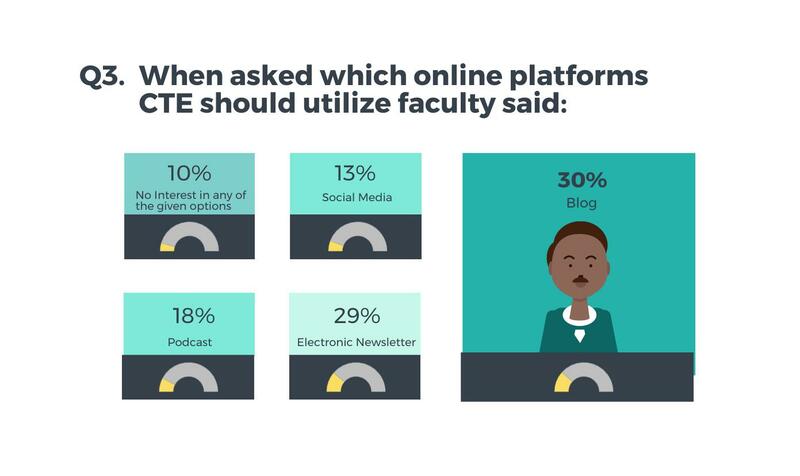 When asked if they would be more likely to engage with professional development with CTE if more online programming was established (including an online blog post, podcast feed, electronic newsletter, or social media platform) a majority of faculty (70%) responded yes. 4. While only 13% of faculty stated that CTE should utilize social media among other online options such as a blog, electronic newsletter, or podcast, a large number of faculty (67%) stated that they somewhat agreed, agreed, or strongly agreed that CTE has a duty to improve excellence in teaching and scholarship by incorporating social media. 5. An even higher number of faculty respondents (80%) stated that they agreed that CTE could project high academic standards and professionalism via a social media platform. 6. Furthermore, when asked about their beliefs that CTE has a duty to inform faculty and encourage collaboration through social media use 61% replied that they somewhat agreed, agreed, or strongly agreed. Results of this survey have been helpful to guide CTE to expand its faculty professional development formats and opportunities. CTE recognizes that faculty most often use websites to engage in professional development. A new section of the CTE website, the Faculty Café, hosts our new CTE Blog and CTE Podcast Series. Both the blog and podcast webpages are meant to help faculty keep connected across campus, and stay updated on CTE related topics and events. In addition, CTE has launched a Facebook Group and Linkedin Group that are only open to IUP faculty. It is CTE’s goal to promote more discussion and learning among faculty via newly launched social media groups on Linkedin and Facebook. The groups aim to provide safe places for faculty to connect with one another and discuss teaching and learning related issues or other topics of interest online. All are welcome! CTE especially invites faculty who primarily teach online and those with schedule or geographic challenges to become involved on our new social media platforms or the Faculty Café as an extension of our campus. Thank you to all IUP faculty who participated in our media survey. See you online and be sure to follow along on our CTE Blog, Podcasts, Facebook, and LinkedIn group pages to keep connected with faculty and stay up to date on CTE events and highlights! *more information about faculty demographics will be published in a follow-up article.